Two hundred years ago, Canada had been fighting off invaders for nearly six months; with First Nations allies, U.S. forces had been defeated at Detroit and Queenston. In addition to the invaluable coalition with Native forces including the great Tecumseh, the invasions failed in part due to the refusal of some brave soldiers to participate. If they had crossed the border, some might doubtless have remained in Canada afterward and sought refuge — just like an intrepid crew of American soldiers has done since the illegal Iraq war began. This past fall, Kimberly Rivera became the most high-profile Iraq resister to be denied sanctuary by Immigration Minister Jason Kenney, who refused to acknowledge that she’d be arrested when she crossed the border. 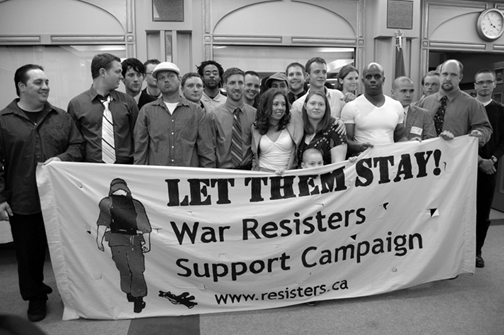 Many, if not most, Canadians supported her expulsion, saying what former Prime Minister Trudeau’s “refuge from militarism” was never meant for deserters, especially in these days without official conscription. But the story of dissenters in uniform is far richer than we know — and people like Rivera have long been part of the (North) American story. Lyon opened his eyes and reached for his weapon, a light infantry “fuzzee” with tamped-down bayonet. Were the Algonkin attacking already? He sat up and ran out the door of the hut. It was July 1776, and all the river breeze in the world couldn’t stop the heat from rising off his neck. What Lyon saw, he had feared. Not the redcoats of the British, nor the tanned and paint-spattered skin of the 500-strong Indian warriors reportedly massing at the next hill: just the backs of his men in formation, preparing to leave the camp forever. In some ways, the 26-year-old lieutenant couldn’t blame them. This was not the mission he had promised when the got them to reenlist. Not here in Upper Canada, after Washington retreated, ordered to “guard” land owned by some rich men they didn’t know. Starving as they were, they told him, they would never buy corn at the owners’ war-inflated prices. It was also to Upper Canada that in 1789 half-Indian Army scout Simon Girty, veteran of a long, scattered military career with the Pennsylvania Line, came north after the notorious Squaw Campaign, which took only two prisoners and suggested that his fellow patriots were more interested in trampling on treaties than besting the British. It was around that time that Lyon told his story publicly: by then, he was a member of Congress. Adams was president, and not there to hear him speak. But he was very familiar with Lyon and his newspaper, The Scourge of Aristocracy and the Repository of Important Political Truths. A few years after his testimony, Lyon would be one of the first Adams ordered clapped in prison, for the new crime of criticizing the President. Lyon’s newspaper also opposed the war that commenced n June 1812, one ostensibly about commerce but spurred by legislators craving Canadian territory. Not so fast: members of colonial militias, who saw their recruiting contracts as sacred documents among equal citizens, balked at the prospect. They were supported in those doubts by the public outrage of veterans like another Revolutionary veteran, the Reverend Noah Worcester— who founded the first national peace organization. I was indeed well satisfied that our country had suffered injuries from Great Britain, by the impressment of our seamen, and by spoliations under the Orders in Council. But I was also satisfied that these evils were exaggerated. […] I regarded the war as having resulted from our own party contests, and the indulgence of vile passions; — and, on the whole, as unnecessary and unjust. Vermont, Virginia and Ohio soon imposed fines against anyone that might “flatter or menace” a member of the militia. “Disorder” here, given that it was conducted squad by squad, appears to have been more a synonym for insubordination. Finally, faced with a combined force of British troops and Tecumseh’s warriors, Hull withdrew and surrendered at Detroit. Subsequent efforts to take the continent were equally disastrous, with unclear leadership, mistreatment and poor communication adding steam to any sincere qualms felt by deserters. At Niagara Falls in November 1812, “At least 100 militiamen stacked their arms and left camp, while another 100 stacked their arms and stood by them,” writes Edward Skeen. Even after the war’s tide began to turn in 1813, Harrison in Ohio successfully obliterating Tecumseh’s threat, many soldiers weren’t sold on Canada. In May the Vermont militia, commanded by Brig. Gen. Jacob Davis, only reported for duty at Plattsburgh “at the point of a bayonet.” A year later, the assault on The assault on Montreal was devoid of glory, 1500 Vermont militiamen refusing to cross the border. While these militiamen no doubt had multiple reasons, they were also being supported by veterans like Lyon and Worcester, whose politics ran the gamut as with veterans of any era. Over generations, dissenting American soldiers fought to have their doubts recognized, eventually forcing the creation of the official category of conscientious objectors inside the military. During World War II actor Lew Ayres, star of All Quiet on the Western Front, served as a noncombatant CO in the Philippines under Major William Kunstler, who after the war became a firebrand attorney representing many Vietnam War protestors. By the latter war, when Trudeau made his famous “refuge from militarism” comment, some soldiers were actually eligible to be discharged as conscientious objectors. It’s not an easy process: the servicemember must pass a psychiatric and chaplain’s interview, after explaining in writing how the military has changed his/her beliefs. In the 1990s, as a staffer on the nonprofit GI Rights Hotline, I coached numerous servicemembers through the CO application, a number of whom were approved. Many others, dissenting just as deeply, are not approved or refuse to participate in even the process. During Vietnam, many of those ended up in Canada, right beside the 20,000 draft resisters welcomed by Trudeau. Among the 12,000 deserters was Keith Mather, then famous as one of the ‘Nine for Peace’ draftees who chained themselves together in a San Francisco church rather than deploy. A month later, detained at Presidio Army Base, Mather helped sparked a mutiny there and fled north. Telling me the story in 2006, “I can’t describe what that did to us,” Wong said softly. Despite Trudeau’s politic dodge that of course deserters broke the law and are thus unwelcome, deserters like Wong and Mather found succor in Canada and contributed, for years. Many still have Canadian families. Their experiences gave young people like Rivera, like Joshua Key, like the estimated hundreds still underground, hope that they’d be welcome in the human family, with their struggles respected. Canada deserves its image as a haven, however clouded. And if it yet again embraced its role as a refuge from militarism, we would all be the richer for it, on both sides of the border.